CURRENT PRICING-Click here for a more complete list of metals we buy and sell. Click above for directions to AMERICAN METAL RECYCLING'S North Royalton retail facility. Or Call 440-237-1500 for directions. TEACHERS & STUDENTS- Click here for information on fundraising and awareness programs! MEMBER; ISRI Institue of Scrap Recycling Industries, Inc.
Give your cause a boost with funds collected by collecting aluminum cans. Sponsor a "Cans for a Cause" drive today! Do you provide container service and pick-up? Absolutely. American Metal Recycling, Inc. offers a variety of container services. Call 440-237-1500 for a quote. Do you work with schools and non-profit agencies as well as business and industry? American Metal Recycling, Inc. has established recycling programs for many community organizations as well as provided opportunities for fund raising. Can I receive cash on site for the material I sell? We pay cash when selling directly to our retail yard.Please bring identification. How do I find metal pricing I can trust? Where can I find recycling literature and brochures? Can anyone buy or sell scrap metal to AMERICAN METAL RECYCLING, INC.? Yes. American Metal Recycling, Inc. is conveniently located in North Royalton, Ohio (off York Road between Rt 77 & 71). We provide services to corporations as well as individuals. How can non-profit organizations raise money? 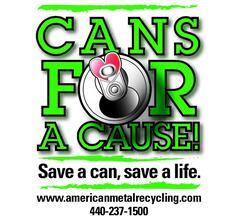 American Metal Recycling gives back a percentage of their profits to benefit the non-profit organizations that collect "Cans for a Cause".We can help you set-up a collection site for cans or other materials at you office, church, school, community center etc. and provide educational seminars.